While the Galaxy Tab 10.1 was bound for T-Mobile from its recent FCC filings, the network never explicitly confirmed its existence until now. T-Mobile officially announced today the 10.1-inch Samsung tablet for its network through its Facebook page. The announcement, unfortunately, makes no mention of 3G/4G or Wi-Fi capabilities, but it is more than likely that the Samsung tablet will be coming with 4G connectivity due to the presence of a 4G radio in the model under review at the FCC. The Galaxy Tab 10.1 with LTE is already available on Verizon. 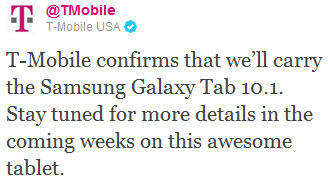 The 7.7-inch Galaxy Tab may be coming to T-Mobile as well. More information on prices and release dates are expected in the coming weeks.